Ford has the most up-to-date heavy-duty trucks now. General Motors is working on the new generation, heavy-duty Silverado and Sierra for the 2020 model year. Ford redesigned the Super Series for the 2017 model year and hard-working models are more capable and modern than ever. For the buyers who need an extra dose of capability, the one-ton Ford-350 provides massive towing and payload ratings and also offers the dual-wheel configuration option. The model comes in a number of options and with two V-8 engines. Ford is working on the heavy-duty 10-speed automatic transmission for the Super Series but it should join the lineup for the 2020 model year. For the 2019 Ford F-350, there won’t be many upgrades. Ford will offer the Lariat Sport package and the same trim will also get the new B&O sound system. The one-ton Super Duty Ford will appear in XL, XLT, Lariat, King, Ranch, Platinum and Limited trim options. The Super Duty Series went through the thorough redesign for the 2017 model year and Ford made radical structural improvements. The high-tensile steel provides improved structural rigidity and towing capability while the aluminum-intensive body contributes to the weight reduction. Visually, the Super Series share the same design theme with the light-duty F-150 and model uses the two-bar style grilles bracketed with the C-shaped headlights. The grille finish and bumper style changes with the trim option as well as the size and design of wheels. The 2019 Ford F-350 won’t make major changes on model’s styling and only the new Lariat Sport Package will add a few new touches. This package will come with the 20-inch wheels, running boards, black exterior elements and spray-in bedliner. Interior of the F-350 will remain in the current form. 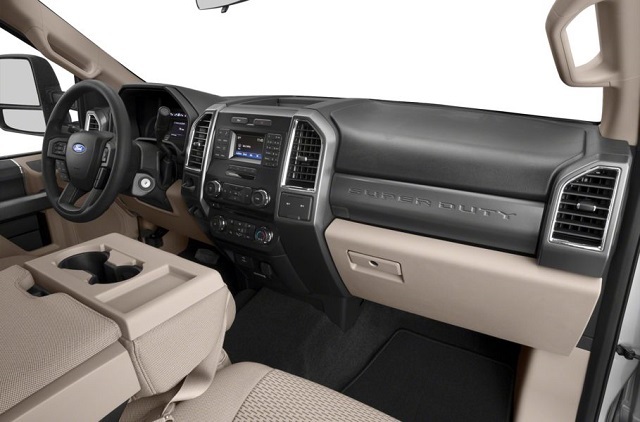 The Super Duty trucks have comfortable and highly functional cabins and also include modern electronics. The build quality is also great but the work versions will start with plastic panels while each upper trim will bring better materials and finish. The trucks also have well-organized controls and one can manage them through the digital commands while physical button can also be used. The good side of the truck is also a number of clever storage compartments in the cabin. The one-ton Super Duty Ford will again come in three cab styles and with the 6.8- and 8.2-foot cargo beds. The dual-wheel setup is also available on this version. The base XL trim starts with the 17-inch steel wheels, vinyl upholstery, air conditioning, driver information display, black grille and bumpers, etc. The next XLT version improves with eth 18-inch wheels, power and heated mirrors, cloth upholstery, Sync infotainment system, keyless entry, and more. The next level of customization, the Lariat adds more luxury features. It brings side steps, parking sensors, dual-zone climate control, power adjustable front seats and pedals, leather upholstery, etc. The Sync 3 infotainment system, Wi-Fi hotspot, a new 10-speaker B&O sound system are also available. The King Ranch has upgraded leather upholstery, heated and ventilated front seats, heated steering wheel, navigation and all combines with the unique alloy wheels and trim accents. The Platinum, as well as the previous trim, are reserved with the crew-cab only. The Platinum combines the 20-inch wheels, multi-contour front seats, adaptive steering and also adds blind-spot monitoring and rear cross-traffic alert. The Limited builds on the Platinum trim features with the panoramic sunroof, surround vision cameras, lane keep assist, adaptive cruise control and interior also come in the two-tone style. 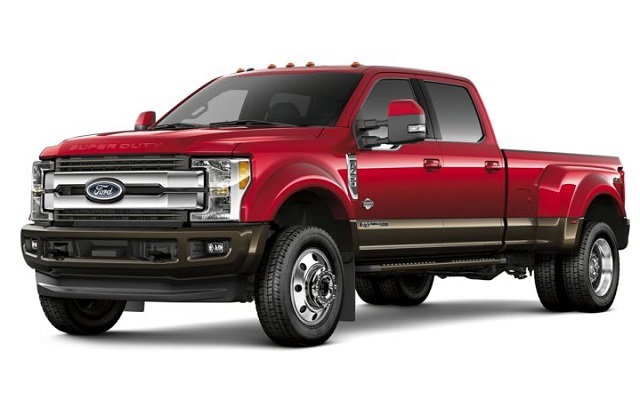 The 2019 Ford F-350 continues to operate with the duo of V-8 engines. A base 6.2-liter gasoline V-8 produces 385 horsepower and torque of 430 pound-feet. More impressive is a 6.7-liter V-8 diesel engine which pumps 450 hp while provides an impressive torque of 935 lb-ft. Both engines come in the combination with the six-speed automatic transmission. The diesel version uses, however, the heavy-duty automatic gearbox. The rear- and four-wheel drive are available and there is also the option for the dual-rear-wheel setup. The model can also be had with the different axle ratios, rear locking differential, trailer tow package, the off-road FX4 package and more. The F-350 allow the payload capacity of up to 7, 630 lbs. The conventional towing limit is up 21, 000 lbs. The maximum 5th wheel towing is up to 27, 500 and the maximum gooseneck towing is up to 34, 000 lbs. The 2019 Ford F-350 will reach the market in the last quarter of the year. The base version will start $34, 320. The XLT will begin from $38, 545 while the Limited costs from $47, 310. The King ranch will climb to $56, 585. The Platinum and Limited will start from $63, 000 and $81, 415 respectively.